The light inside the large hall of the Edinburgh College of Art is dim. Your eyes adjust to the darkness as you walk in, noticing the faint outline of erect spikes piercing white sheets. You imagine the spikes as flagpoles, the sheets as white flags—not of surrender, but of purity. There are words on those sheets, words that have survived. You notice microphones hanging from the ceiling. There are 100 of them, scattered, like hanging heads, bodies missing. The microphones are black. The mikes aren’t for you to speak—you can only listen. The speakers within the microphones amplify the voices being suppressed. What you hear is not a dictator’s propaganda, but a poet’s words, typed on those sheets, which the arrogant spike pierces. But the words get passed along, in songs, in poems, in whispers, even in silences when memorized. The light is let in as if reluctantly. You sense the shadows, the faint outline of figures—other visitors walking around—like inmates in a cell. But it is the light of a prison cell: not enough to read, reminding you of the brightness you are deprived of because you are a prisoner without a name in a cell without a number. The light, like life, is outside, beyond reach. The voices are in Hindi, Chinese, Azeri, Arabic, English. You notice the whispers. In Eastern Europe during the Communist years, it was said that when you can’t trust the written word, you believe the spoken word. Words written on tiny slips of paper, read, and then the paper chewed and swallowed, so that nobody finds out you had that sheet, nobody ever identifies the handwriting. Words passed along, one ear to another. Ears that listen and remember, ears to the ground, like in Carolyn Forché’s poem after her encounter with a general in 1978. Whispers that reverberate in the mind. 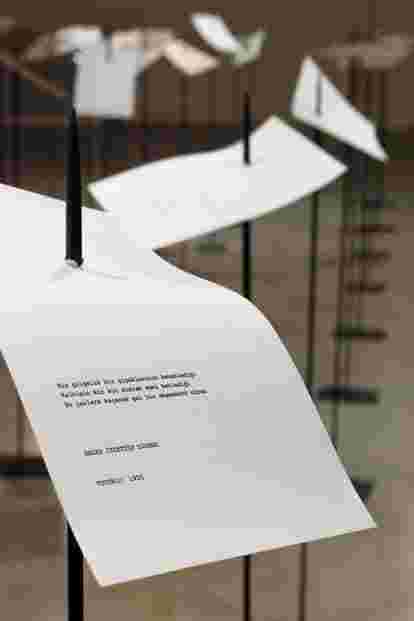 The phenomenal strength and genius of Shilpa Gupta’s latest installation, For, In Your Tongue I Cannot Hide is to give us a multisensory experience of what it means to be in jail for the crime of writing. As she reminds us, this has gone on for at least a millennium. Her homage to imprisoned poets emerged from a previous work, Someone Else—A Library Of One Hundred Books Written Anonymously Or Under Pseudonyms (2011), where writers wrote under fictitious names, concealing gender to avoid persecution, or in a banned language. After that project, she started looking at the moments “when words caused such discomfort to those who sought to restrict imagination. That, along with the changing atmosphere in India, which has been turning restrictive, with liberal thinkers, writers and film-makers being targeted, first triggered this work and I became interested in the power of words and the nervousness around it felt by those in power," she says. In early 2017, at a poetry festival in Mumbai, I had given a keynote address in which I had paid tribute to jailed poets around the world—South Korea’s Kim Chi Ha, Russia’s Osip Mandelstam, Turkey’s Nazim Hikmet, and many more. Gupta read that speech and decided to research further, and discovered a wider universe of silenced poets, many of whom I was unaware of. In the weeks that followed, we had many conversations, in Mumbai, at the Bandra Promenade, watching her installation We Change Each Other come alive as the sun set, and in London, at an art gallery where she was planning her new show; over coffee (for me) and hot chocolate (for her); and on long phone calls. “Poetry, it seemed to me then, occupied a space in our minds which was more ruptured, would be indirect, closer to one’s self. And I have been interested in the lightness and persistence of an individual’s aspirations and dreams, and the weight of the larger structure that he or she is surrounded by," Gupta said when we met at the opening of the Edinburgh Art Festival, where her installation is a major commissioned work. It has already been shown at the Yarat contemporary art space in Baku, Azerbaijan, and is due to travel to Brisbane later this year. The idea for the installation had been brewing for some time. In 2008, Gupta met Noam Chomsky, and, during their conversation, he said something that has stayed with her, that most people want peace. A few years later, her friend film-maker Madhusree Dutta, returned her National Award, joining the protests by the community of film-makers and writers in India against rising fundamentalism. Gupta reflected on these experiences, and felt the need to respond to the narrowing of minds, which she describes as the moment “when the social space is becoming dominated by certain voices who speak the loudest, claiming to speak for others, postulating extreme views, which don’t quite match with people you meet otherwise". Gupta tells stories of “heretics" Giordano Bruno and Imadeddin Nesimi; of Liu Xiaobo denied the dignity of commemoration; of Palestinian Dareen Tatour jailed for writing a revolutionary poem; of Mandelstam in a solitary Stalin-era cell. And Hikmet, writing about a prisoner “turning the pages with cuffed hands". There is an interconnected theme in all her projects—a concern for humanity, a keenness to discover what brings us together and a deep longing for freedom. The poet in captivity is never alone, the French writer Alain Mabanckou wrote to the jailed Cameroonian poet Enoh Meyomesse, “...because when writers are thrown in prison, they are followed in their cells by an army of readers and the loud footsteps of their outraged colleagues". Poets are the ears to the ground, the eyes that see even when blindfolded, the tongues that speak long after they have been lacerated, and the minds that can’t be caged. Poetry is the umbrella in Hong Kong, the cellphone in Cairo, the man in front of the tank in Tiananmen. Gupta remembers them. She holds a mirror, forcing us to look. For, In Your Tongue I Cannot Hide is on view till 26August as part of the Edinburgh Art Festival.